1 of 6 Line a large baking sheet with nonstick foil. Coat foil with nonstick cooking spray. 2 of 6 Remove stems from apples; wash and dry apples. Insert wooden stick into stem end of each apple. 3 of 6 Place unwrapped caramels in medium-size saucepan. Add 3 tablespoons water; heat over medium-low heat, stirring occasionally, until caramels are melted and smooth. 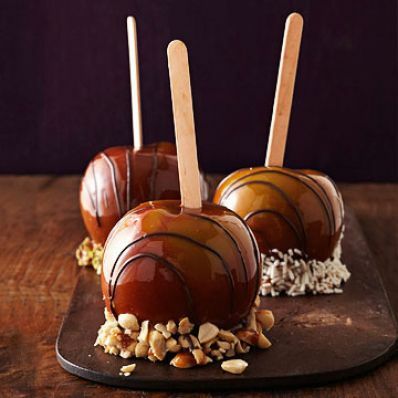 4 of 6 Working quickly with one apple at a time, and keeping caramel over low heat, dip the apple into the caramel, turning to coat the apple completely (tilt pan slightly for easier dipping). Remove apple from caramel, letting excess caramel drip back into saucepan. Scrape bottom of apple on edge of pan, and transfer to prepared baking sheet. Repeat with all apples. 5 of 6 Press pistachios, peanuts or sprinkles onto bottom of apples and 1 inch up the sides; place in cupcake liners on new baking sheet. Refrigerate 10 minutes or until caramel is cool. 6 of 6 Meanwhile, melt chocolate with shortening in a small glass bowl on HIGH in microwave for 1 minute. Stir until smooth. Transfer to a small plastic bag; snip off corner. Drizzle over apples. Refrigerate until hardened, about 20 minutes. Store in refrigerator. Per Serving: 5 g pro., 74 g carb., 9 g Fat, total, 5 mg chol., 5 g sat. fat, 4 g fiber, 182 mg sodium, 378 kcal cal.